Dinner at the Grill Room of Hong Kong Country Club. Dinner at La Paloma in Macau. 1991 Alejandro Fernández Janus Gran Reserva Pesquera - nose of potpourri, dried herbs, savory minerals, ripe and a little cooked, minty. Very smooth on the palate with silky, velvety tannins. Lunch at The Eight in Macau. Dinner at Guincho a Galera in Macau. 2010 Bacalhôa Chardonnay Cova da Ursa - big nose of toasty oak, mineral, lemon, ripe, a little sweet with a hint of vanilla. Not bad at all. 2008 De Pancas Touriga Nacional Reserva - sweet, ripe, plummy, forest, dried herbs, pine and cedar. A little sharp and alcoholic. 2007 de la Janasse Terre d'Argile - this Côte-du-Rhône Villages was chosen by Mathieu to go with my lièvre. 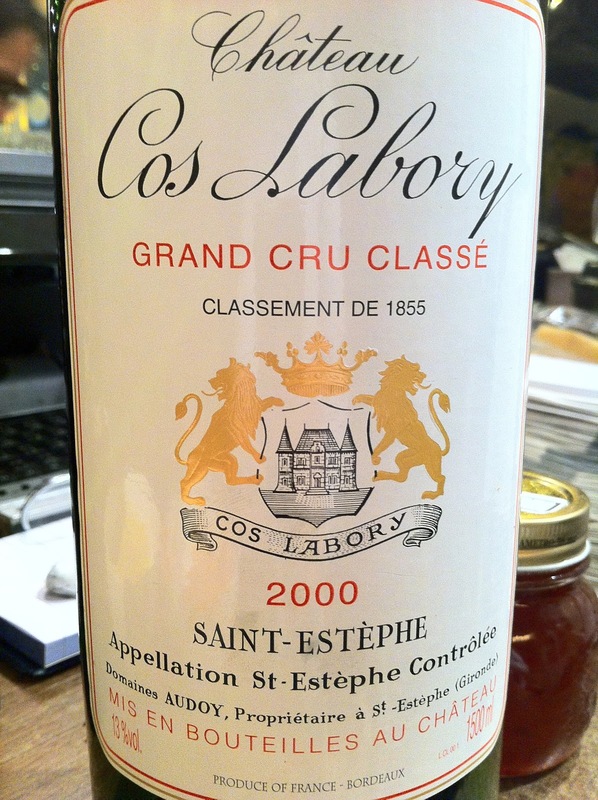 Showed nose of blueberries, mint, pine, potpourri, very ripe and almost jammy fruit. Not bad. Wines tasted at Bonham's auction in Hong Kong. 2010 Guigal La Doriane - floral, lovely, aromatic, so typical of Viognier. Nose was killed by the intense air freshener inside the Shangri-La Hotel. Slightly flat on the palate, and a little bitter on the finish. 1978 Ardbeg - peaty, caramel and very floral. Very nice. 1986 Cheval Blanc - ripe fruit, sweet, smoky, soy sauce, tea and cedar notes. Smooth and velvety, and very lovely. Dinner at West Villa in Hong Kong, at Bonham's invitation featuring wines from Massandra. Dinner at the Chairman in Hong Kong. Blin's Édition Limitée Blanc de Blancs - a bit mineral and mild on palate. 2000 Réserve de la Comtesse - classic and smoky. Good acidity balance and smooth on the palate. Surprisingly a little sharp and alcoholic, and I could feel the alcohol burn a little as the wine went down the back of my throat. L'Or de Parigot - nose of red fruits, slightly tart on the palate. 2007 Joh. Jos. Prüm Zeltinger Sonnenuhr Riesling Spätlese - classic nose of petrol, mineral and pear. Light sweetness. Served pretty cold but it was OK.
1998 d'Arenberg Shiraz The Dead Arm - very typical Aussie, with lots of sweet vanilla and coconut, along with smoky notes. Reasonably smooth on the palate by now. Krug Grande Cuvée en magnum - smooth, more subtle and subdued than usual. Lovely on the palate. 2005 Pax Syrah Kobler Family Vineyard from magnum - a big wine, no doubt, but surprisingly accessible after about 2 hours of aeration. Still fruity and forward, and jammy. A little metallic minerals. The Great Winemakers of Italy dinner organized by Bordeaux Index at Domani Ristorante. Wine dinner at Cuisine Cuisine at the Mira in Hong Kong. 2004 Diel Dorscheimer Goldloch Riesling Sparkling Brut - notes of orange, lemon and minerals. A little ripe on the palate and slightly bitter. 2011 Diel Dorscheimer Pittermännchen Riesling Kabinett - white flowers, very elegant, a little ripe tangerine. Nice level of sweetness for food. 2011 Diel Dorscheimer Pittermännchen Riesling Spätlese - white flowers, very elegant, sweeter on the palate and fatter. 2008 Diel Dorscheimer Goldloch Riesling Großes Gewächs - nose of petrol, mineral, white pepper, white flowers. Dry but slightly ripe on the palate. 2002 Diel Dorscheimer Goldloch Riesling Auslese Goldkapsel - marmalade, acetone, honey. Lovely. 1990 d'Auvenay Meursault Les Narvaux - lots of heavy, intense toasty oak, flint, very ripe, with a hint of honey. Nose was absolutely beautiful after about an hour. 2005 Dugat-Py Bourgogne "Cuvée Halinard" - minty, forest, exotic spices. 1971 Schloss Schönborn Hattenheimer Nußbrunnen Riesling Beerenauslese - orange marmalade, honey and acetone on the nose, pretty sweet on the palate with some acidity. My contribution. Full post on the dinner is here.